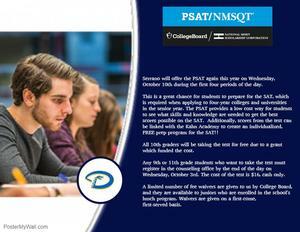 Serrano will offer the PSAT again this year on Wednesday, October 10th during the first four periods of the day. Serrano Skills USA had five students win at regional's in January, which qualified them for State. Three in Early Childhood Development and two in Introduction to Woodworking. We went to State Skills USA April, 19th, Thursday and came back Sunday the 22nd. Jaden Steele won the Bronze Medal In Intro Woodworking. Pretty cool stuff!!!! If you see him he deserves a big Congratulation. Tyler St. Peter also competed in Woodworking and did a fantastic job. In Child development Savannah Minnwalla, Allison Smith, Kimberly Huerta competed at State Skills USA. Congratulations to all of our students for going above and beyond! Students who still need to register for the Snowline summer school program can go to Chaparral High School June 11-15 from 9:00 AM-12:00 PM. A parent/guardian and the student must be present to register, and all login information will be given at that time. Students who have already turned in their Snowline summer registration to the counseling office will receive their login information via email sent to their Snowline email account. This Friday Peer Leaders will be hosting Say Something Day 2018 to bring awareness to creating a safe and healthy Serrano. Each student will receive 8 tickets. Everyone attending must have a ticket. The students will be receiving their tickets on May 23rd. GET YOURS MONDAY AT LUNCH! BRING YOUR ID, OR NO BOOK FOR YOU!!! Double 3rd - Spring Rally Today! Serrano Students, please take a moment and take this quick three question library survey. We want to hear your voice.